This notebook keeps up with your professional look and style while meeting your everyday note taking needs. 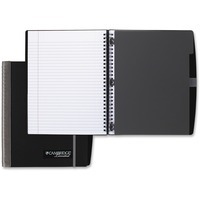 Stylish wirebound notebook features a stiff, durable cover and a clear double sided pocket. Using 20 lb. paper, this notebook features 100 sheets of white, legal ruled pages that are perforated for easy removal. Notebook also features a spine guard, pen loop and bungee closure.